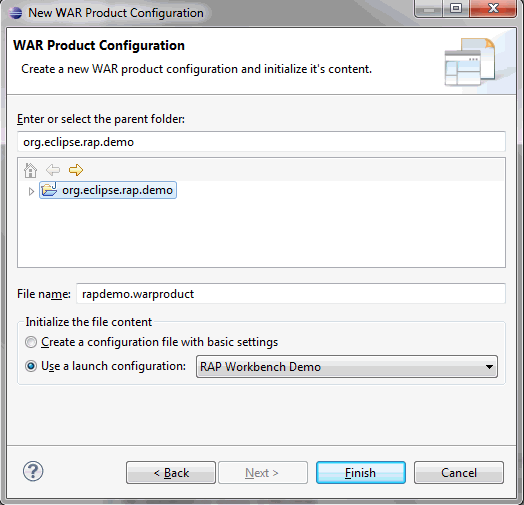 The following tutorial shows how to create a WAR file that contains the org.eclipse.rap.demo project as a RAP application. Note: As with RCP applications there are a wide variety of possible configurations. What's given in this tutorial is just one possibility. are familiar with the bundles- and build information section of the Equinox in a Servlet Container document. 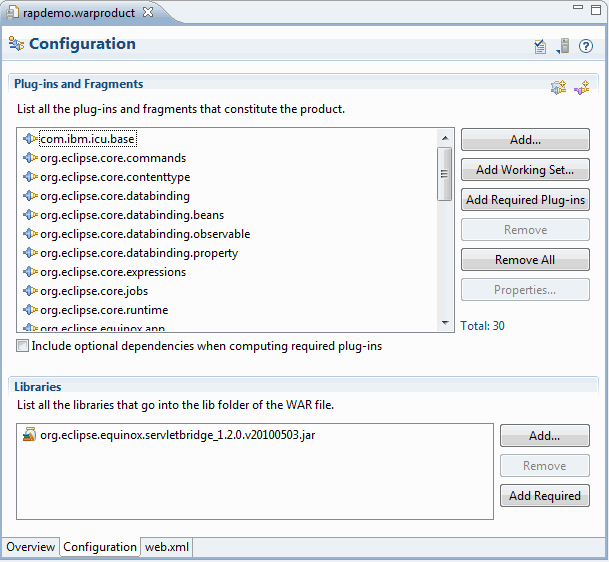 have installed the WAR Products tooling from this p2 repository http://download.eclipse.org/releases/kepler/ into your IDE. This tooling is part of Libra and not part of RAP. Anyway it can be used to deploy RAP applications in a very comfortable way. have set a target platform that contains RAP. 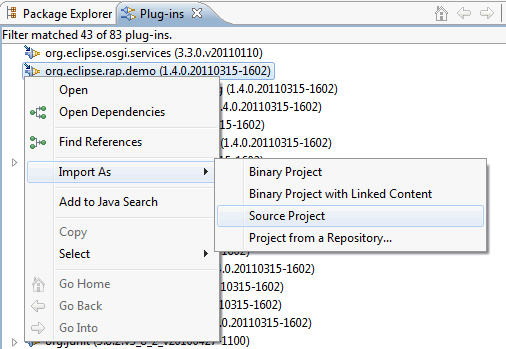 Select the org.eclipse.rap.demo plug-in and use the command Import As > Source Project from the context menu to import org.eclipse.rap.demo as a project in your workspace. Open the New WAR Product Configuration wizard. Enter a name for the war configuration file and select the RAP Workbench Demo from the available launch configurations. Overview: on this page you can enter additional information like ID, Name, Version but they are not needed to export a war archive. Also the WAR Product export wizard can be started from the Overview page. Configuration: Here you can manage which plug-ins and libraries to be included into the war archive. web.xml: On this page the web.xml of the war archive can be edited. 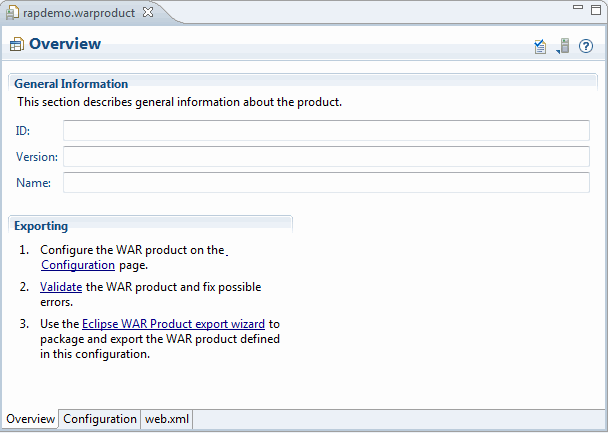 From the Overview page of the .warproduct configuration editor start the WAR Product export wizard (this can also be reached by launching the general Export Wizard), enter the location for the war archive and press Finish if no validation errors exist. After that you can deploy the WAR file to a servlet container. 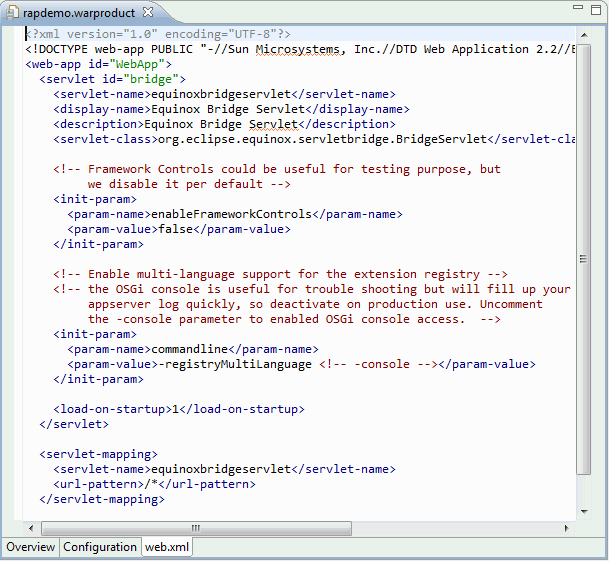 See the uncommented sections in the web.xml for more information on how to activate the OSGi-console. This is useful if you run into troubles while deploying the generated WAR file. How to deploy my own application? To deploy your own application like described above you will have to create your own .warproduct configuration. The configuration should contain the same plug-in references as the rapdemo.configuration (except the demo-plug-in of course!) plus the plug-ins that make up your application. It is important that your plug-ins reference the Servlet API by using the Import-Package directive instead of the Require-Bundle directive. See the MANIFEST.MF of the demo project for an example. Are you exporting the plugin.xml? If you are using plugin.properties files, make sure they are exported. Are all libraries you are using listed on the plug-ins class path? Tip: As PDE build sometimes swallows error messages try exporting your feature with Deployable Feature export, this may turn up error messages. Type ss in the console and see if all bundles are started. If not try starting them with start <bundle-id>. The stack traces may hint to what is missing. Make sure that there is a org.eclipse.equinox.servletbridge.extensionbundle in the ss-listing who's state is RESOVLED. Make sure that the WAR does not contain the javax.servlet bundle. In the plug-in manifest the javax.servlet must be listed in the Import-Package section, not in Require-Bundle. 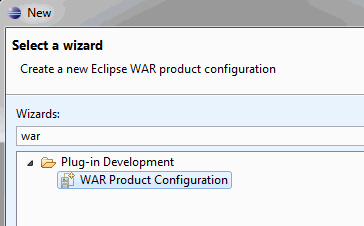 Make sure that the WAR does not contain the org.eclipse.update.configurator bundle. Does the WAR contain compile errors? If so, you will probably find a zip archive somewhere in your output folder. It contains log files with the compiler output. Create a product configuration with an arbitrary name (File > New > Other > Product Configuration). Select The product configuration is based on features on the Overview page. Add your feature to the list of features on the Dependencies page. Press the Validate button in the top-left corner of the editor. Ignore complaints about missing javax.servlet packages. Be aware that unresolved optional dependencies aren't reported as errors. If you are re-deploying, make sure to delete the work directory of your servlet engine (e.g. <tomcat_install>/work/Catalina/localhost/<webapp_name> in Tomcat).